If your house is very spacious, or if your flat has long hallways, you will be glad to know that adding a rug or two makes your house fancier. Toss in a cosy Armenian carpet in that narrow hall, or add a square rug on your living room floor. It’s a simple addition, but it makes the room feel and look different. The typical British bathroom has white floor tiles. If your bathroom is among those typical ones, it might be time to add a little colour to it. Using tiles with neutral or soft colours, like powder blue, will make your bathroom more unique. Additionally, using a different floor tile colour accentuates usually white bathroom appliances, like sinks and whirlpool baths. This rule applies to any other part of the house as well. Just remember to keep colour tones soft for bedrooms, and neutral colours for living rooms and kitchens. If you are up for a little more experimentation, try using bright and deep coloured carpets. Hanging curtains with a more colourful hue in doorways or windows is easy and cheap, and they surprisingly have a huge effect on the rooms that they adjoin. When deciding what curtain to hang for your doorway, consider the colour of your walls. Choose a curtain that greatly contrasts to the surrounding walls. Curtains may also include those in bathrooms. Hanging a rod and curtains in front of whirlpool baths or showers can make your bathroom look extravagant with just this little addition. Changing the colour of certain objects in the home greatly changes the overall appearance and ambiance of rooms, just like in the tips above. Repainting surfaces is another way of doing this. Painting not only adds colour, it also serves as an extra coat of protection on surfaces, especially on things like wood. Consider painting cabinet or shelf interiors with bright colours like orange or yellow, or repaint wooden dining chairs with something pastel. This may sound cliché, but moving furniture is a priceless way of making your house look different. 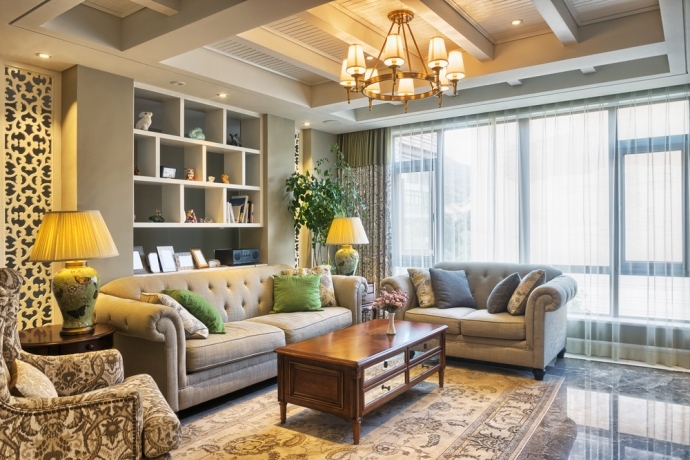 Moving any kind of furniture away from the walls makes furniture, especially sofas and tables, appear closer to each other and more intimate, while moving furniture towards walls gives the illusion of space. The things you can do to your house are not limited to these tips alone. Hanging various sizes of framed pictures, adding antique furniture to room corners, or using tablecloths on surfaces are some of the other things that you can do. Having a stylish home does not have to be expensive.